Point Pleasant senior Olivia Pyles hits a forehand during an April 11 match against Huntington Saint Joseph at The Courts in Point Pleasant, W.Va.
Point Pleasant junior Sarah Deem hits a serve attempt during an April 11 match against Huntington Saint Joseph at The Courts in Point Pleasant, W.Va.
POINT PLEASANT, W.Va. — A week’s worth of ups and downs, just not in that order. 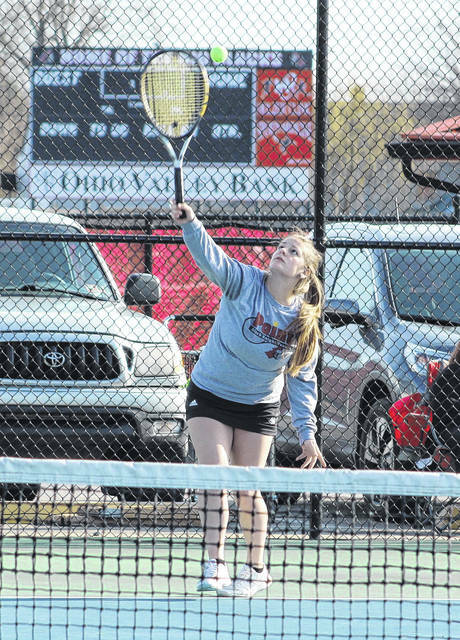 After dropping three of its final four matches last weekend, the Point Pleasant girls tennis team rebounded nicely with three consecutive victories over Lincoln County, Nitro and Sissonville this week to improve to 8-4-1 overall this spring. The Lady Knights had a tough go with things after suffering a 6-1 loss at Winfield on Thursday before dropping a pair of road contests with Chapmanville (5-2) and Logan (5-2) on Saturday. Point’s lone win came Friday by a 5-2 margin over visiting Sherman. That rough weekend stretch left PPHS at 5-4-1 overall headed into Tuesday’s match against visiting Lincoln County, but the Red and Black rolled to a 7-0 victory. The Lady Knights followed up with a hard-fought 4-3 win over Nitro at West Virginia State-Institute on Wednesday, then polished off the week with a 7-0 victory over visiting Sissonville. 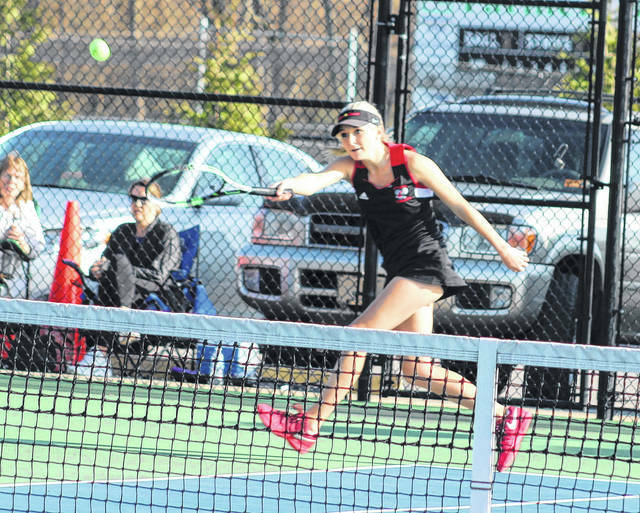 Point Pleasant did not surrender a single game against LCHS on Tuesday as all seven matches ended in 8-0 triumphs. Olivia Pyles beat Madison Bowman in first singles and Bailey Barnett defeated Mackenzie Dunlap in second singles. Caroline Foreman knocked off Mikayla Toppins in third singles and Sarah Deem beat Makenna Gallion in fourth singles. Pyles and Barnett downed Bowman and Dunlap in first doubles, while Foreman and Deem ousted Toppins and Kaylyn Elswick in second doubles. Danielle Marcum and Olivia Martin also defeated Gallion and Madison Dean in third doubles. The big match of the week came Wednesday against Nitro. Both squads were tied at two after singles play, and the Wildcats took a 3-2 lead after winning a tiebreaker in first doubles. The Lady Knights rallied with convincing wins in the remaining two doubles matches to pull off the 4-3 outcome. Barnett secured an 8-2 win over Katie Eddy in second singles, while Deem netted an 8-2 win in fourth singles. Pyles dropped an 8-0 decision to Peyton Mann in first singles, then Foreman lost 8-4 to Halie Hagerman in third singles. Pyles and Barnett suffered a 9-8 (7-2) setback to Mann and Eddy in first doubles, but Foreman and Deem answered with an 8-4 victory over Hagerman and Baldwin in second doubles. Marcum and Martin posted a decisive 8-1 win over Allison King and McKenzie Haverty in third doubles, wrapping up the comeback victory. The Lady Knights completed the week by surrendering only five games during their 7-0 sweep of Sissonville on Thursday. Pyles defeated Kaitlyn McClung by an 8-3 margin in first singles, then Barnett was an 8-0 winner over Savannah Watts in second singles. Foreman posted an 8-0 win over Emily Asbury in third singles, while Deem netted an 8-0 victory over Josie Slater. Pyles and Barnett defeated McClung and Aftoa Myers 8-0 in first doubles, then Foreman and Deem claimed an 8-0 win over Asbury and Slater in second doubles. Marcum and Martin also defeated Watts and Haley Mullins 8-0 in third doubles. Deem also secured individual victories in each of her four fourth singles matches against Winfield, Sherman, Chapmanville and Logan. Barnett has second singles wins against Sherman, Chapmanville and Logan, while Pyles won her first singles match against Sherman. Pyles and Barnett also had a first doubles win against Sherman, as did Marcum and Marin in third doubles.